Feito sob medida para as necessidades de viajantes com tempo limitado na Romênia, este passeio de dia inteiro pela Rodovia Transfagarasan permite que você marque dez destaques da Transilvânia em apenas um dia. Partindo de Brasov, você visitará maravilhas naturais, incluindo a Cachoeira de Bâlea e a Barragem de Vidraru, além de explorar marcos culturais como o Mausoléu de Dragoslavele, o Mosteiro de Curtea de Argeș e o Castelo de Poienari. 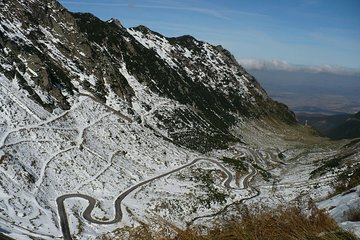 Admire a beleza etérea da Rodovia Transfagarasan, saudada como uma das estradas mais pitorescas do mundo, e aproveite a conveniência da coleta e desembarque em Brasov. Dê o pontapé inicial em sua excursão às 8h e embarque em uma minivan em seu hotel em Brasov. Inicie sua jornada cênica imediatamente, cruzando a rota montanhosa de Bran Pass. Então, saia das montanhas para visitar o Mausoléu de Dragoslavele, um monumento dedicado às vidas perdidas dos soldados romenos da Primeira Guerra Mundial. Depois de voltar para o veículo, você seguirá uma rota dramática pelas Montanhas de Fagaras e partirá para explorar o Mosteiro de Curtea de Argeș, onde as sepulturas da Família Real Romena estão localizadas. Prossiga para o Castelo Poienari do século 15, construído pelo lendário governante romeno Vlad, o Empalador, e opte por ascender a 1.500 para uma grande recompensa visual. De volta ao seu veículo, continue subindo as rotas das montanhas até chegar à parte mais espetacular da Rodovia Transfagarasan. Aproveite o tempo para capturar as fotos da represa do Vidriu e continue até a parada final, Balea Waterfall e Balea Lake. Absorva o cenário deslumbrante antes de retornar ao seu veículo e relaxar durante a viagem de volta ao seu hotel em Brasov. This tour started off well but ended up being long and boring. The driver was nice enough but was too involved and made us feel rushed also we didn't get a moment to ourselves to enjoy the scenery as he was constantly there rushing us along. The first part of the day going up to Balea lake was really great but I wish we would have just turned around and gone back down on Transfagarasean and made it back to Brasov with time to spare. Instead we went down on the other side of the mountain, went to the dam which was cool but not worth it and then after that it was just a 3-4 hour ordeal going thought boring villages with bad roads, not much scenery or any other attraction points that we were interested in. I know that this was all advertised and I knew that we would not return down Transfagarasean but I really wish we did as the drive back was exhausting and pointless. Also the driver was not a guide, just a driver so we drove in silence for most of the day, I ended up listening to a podcast on the way back as I could not take the silence anymore. It was ok but could have been much much better. I would definitley recommend this tour! Everything it says and more. Our tour guide was awesome! A fabulous day with a bit of everything! Interesting history, walking and stunning mountain scenery. Florin was very charming and informative and couldn't have been more helpful. It is a long day but well worth it.